Jane Peterson was born in Elgin, Illinois in 1876 and began her formal art training in 1894 at the Pratt Institute Art School. 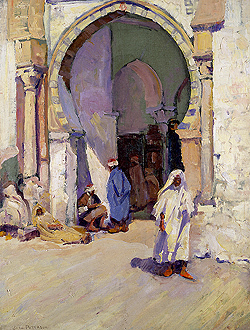 From there she sojourned to Europe, traveling and studying with many of the important artists of the day, including Joaquin Sorolla y Bastida in Madrid, Frank Brangwyn in London, and L’hote in Paris. 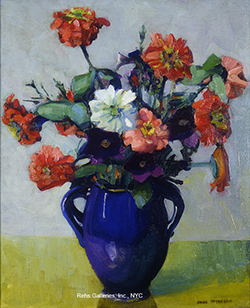 Peterson specialized in portraying still lives and landscapes in a colorful, semi-Impressionistic, manner – showing a profound influence from both Sorolla and Brangwyn. 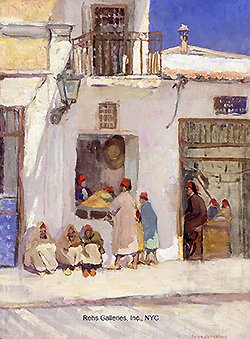 From 1914 – 1919 she was an instructor at the Art Students League and soon became a member of numerous clubs and societies, Including the American Watercolor Society; National Association of Women Artists; Pen and Brush Club; Connecticut Academy of Fine Arts; and the Française de Artists, Paris. 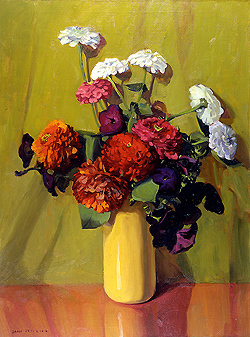 During her lifetime she exhibited her works throughout the United States and Europe and was awarded prizes in Paris (1915); Connecticut Academy of Fine Arts (1916 & 1917) and at the national Association of Women Artists (1919 & 1927). Along with these general exhibitions, she held numerous one-woman shows at the Thayer Museum; Joslyn Museum; Charles A. Wustum Museum of Fine Arts; Syracuse Museum of Fine Arts; Springfield Art Museum; San Jose State College and the Santa Barbara Museum of Art. Today examples of her work can be found in the collections of the: Brooklyn Museum; Syracuse Museum of Fine Arts; Richmond Art Museum, Indiana; Society Four Artists, Palm Beach; Wesleyan College, Macon, GA.; Wichita Art Museum and Brooklyn Athletic Club.